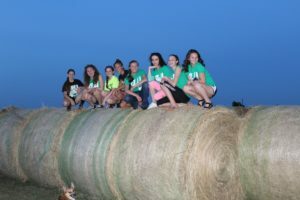 And while this mission still includes livestock, 4-H programs have expanded to include everything from STEM to agriculture, allowing children across the country to be involved in anything that interests them, both on the farm and off. Celtan Holmes is an incoming freshman at Yelm High School and is a member of Diamonds in the Ruff 4-H club. He has been involved in 4-H for eight years. He became active in the program through a family friend whose daughters participated in dog 4-H. He says at first they had to talk him into it, but after going to a few practices, he was hooked. “That club became like family,” Celtan says. “I just wanted to go every week and spend time with my dog.” His first dog was a Great Dane/lab mix named Merrick. That first year he won the high point at the Thurston County Fair. Since then he has had a Pomeranian named Coco and now an all-black Chow Chow named Shadow. Celtan and his dogs have participated in showmanship, obedience and agility. On section of 4H, YA4H, is a group that promotes healthy living. Just last weekend Celtan was at the local farmers’ market, handing out smoothies as part of this project. His group talked to people about making smart food decisions. His group is also organizing a day camp for kids next month. Lucas Swearingen also started out in dog 4-H with the Mutts-k-teers 4-H club. 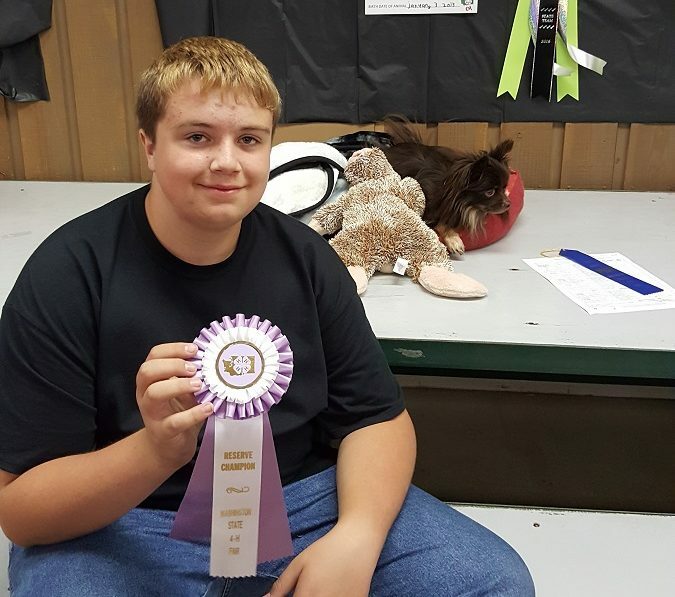 He began at just 5-years-old in the 4-H Cloverbud program. “I love showing my dog. It’s really fun and our club just got agility equipment which is fun,” Lucas says. 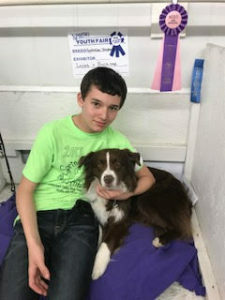 He has an Australian Shepherd named Buck that he will be showing in showmanship, obedience and agility at the Thurston County Fair. 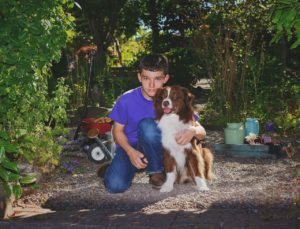 Now, as an incoming freshman at North Thurston High School, Lucas is involved in several 4-H projects including dogs, goats, Teen Leader Club, Interstate Exchange Club, STEM Club (Robotics), baking, arts and crafts as well as horticulture. In addition, he just started shooting sports. 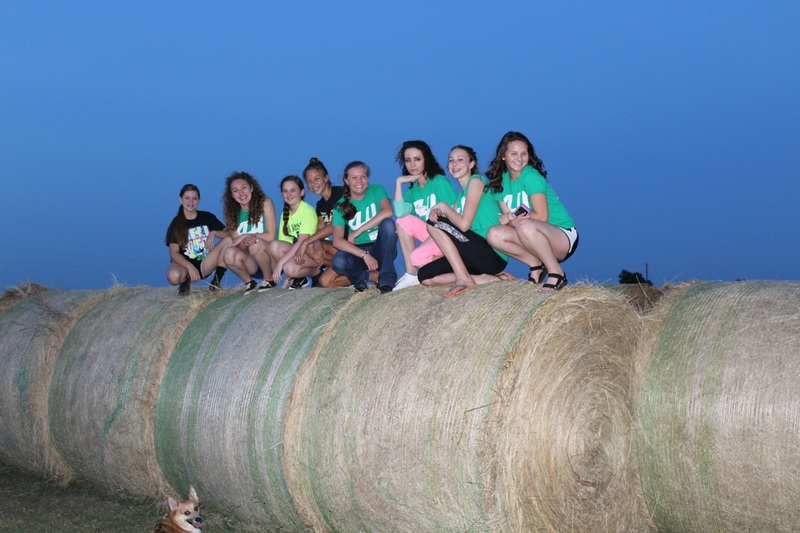 For the Exchange Club, 4-H’ers visit each other’s towns and learn about their area. Lucas says he really likes the non-animal related 4-H clubs because of the diversity. His favorite of those is STEM. “I like STEM because each year there is another new project that someone’s built that’s fascinating,” he says. This year their project was First Lego League – a competition where they had to build a robot out of Legos and have it perform a series of tasks. Laura Chapman, from Tenino, was eight-years-old when she and her sister got involved in 4-H with goats. During her ten years in 4-H, she completed plenty of livestock projects (meat/dairy goats and market lambs), but she was also involved in the Teen Leadership Club and Know Your Government 4-H Conference. She also entered sewing, baking, canning, gardening, photography and knitting in the past. Finally, she has given public presentations and created educational displays. The Leadership Club is another group that Laura really enjoyed. She says she learned important skills that great leaders are made of, including how to be flexible and open-minded, without even realizing it. 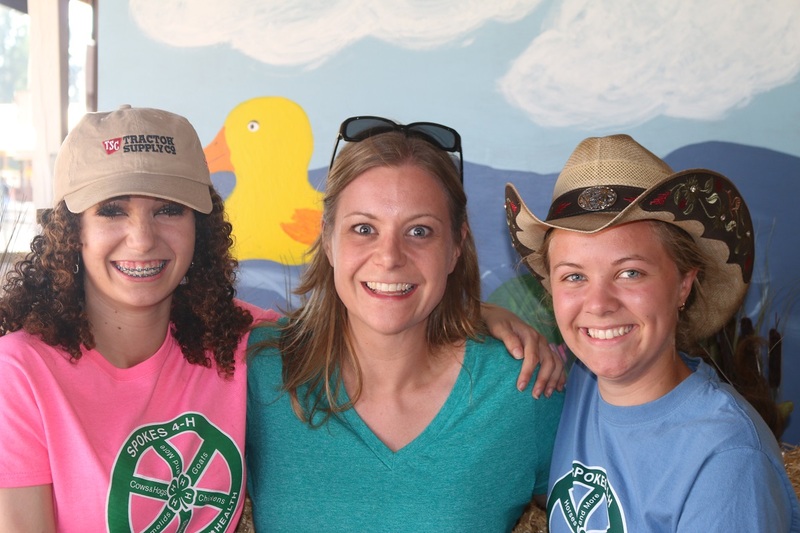 All three young adults agree that the best part of 4-H is the friendships they make. Their favorite part of fair week is getting to spend it with friends who have become like family to them. So this year when you are at the Thurston County Fair, take time to check out all the 4-H barns, including the non-livestock ones. There is something for every kid’s talents or interests.